After the death of her father and downsized from her job, Dana Lewis moved to California’s Blossom Valley to help her mother and be the marketing head/staff fill-in/chief bottle-washer for the O’Connell Organic Farm and Spa. Having never met a vegetable she liked or snack food she didn’t, Dana never thought she would find such happiness there, much less be marrying Blossom Valley Herald’s reporter Jason Forrester. Having the ceremony on the farm was the perfect of blend of beauty and practicality, especially as it means everything can be sourced from local vendors. After one mystery cliché-avoiding fake-out, a follow-up consultation with the Don’t Dilly-Dahlia Flower Shop’s owner Bethany Lancaster leads to Dana’s misfortune of finding the woman shot to death in her store. Bethany’s daughter Violet quickly steps in to take over the shop, so while Dana will at least have her perfect bouquet, a misinterpreted conversation inadvertently places Dana on the suspect list. Although her mother wishes that Dana would focus on her upcoming nuptials, the shadow of suspicion compels Dana to look closer at those who wished the florist dead. Bethany had a not-so-secret reputation as a snoop who reveled in knowing everyone else’s deepest and darkest secrets, but it was her less-known habit of using them for her benefit that may have led to her murder. With a population of just five thousand, it appears as though Blossom Valley has its share of skeletons in closets, not to mention those willing to kill to keep them there. A cantankerous gelato store owner with an eye for expansion, a cheating attorney, and even Bethany’s own daughter are among the number hoping that the florist took her secrets to the grave. This is wonderful series that continues to entertain by evolving its characters and allowing them to change. Dana has grown from the being the fast-food chomping, vegetable-phobic junk food craver to one who can appreciate a home-cooked, freshly grown, meat-free meal. O’Connell’s micromanaging manager Gordon Stewart may still monitor Dana’s overlong lunch breaks, but they have both mellowed to the point where Dana is asking him to walk her down the aisle. Even Dana’s little sister Ashley, who values her shoe collection and has a three-dates-and-they’re-out dating rule, may finally be open to long(er) term relationships. This sixth in the Blossom Valley Mystery series has never been more delightful or humorous, and it remains just as fresh as O’Connell’s garden produce. An appropriately whimsical ring bearer perfectly encapsulates the tone and sentiment of the novel, with readers left satisfied but eager for another stay in Blossom Valley. 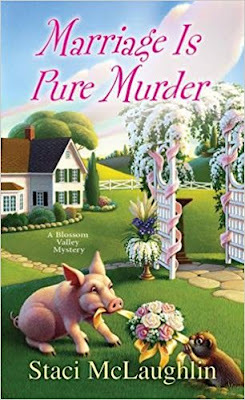 To enter to win a copy of Marriage is Pure Murder, simply email KRL at krlcontests@gmail[dot]com by replacing the [dot] with a period, and with the subject line “marriage,” or comment on this article. A winner will be chosen June 24, 2017. U.S. residents only. If entering via email please included your mailing address. This is a new author to me and I would enjoy reading the book.